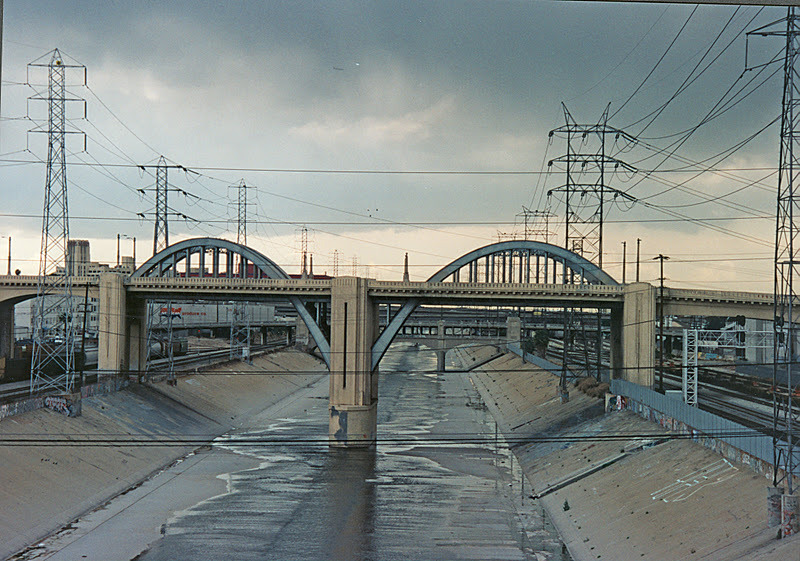 Unlike the other river crossings, the Sixth Street Viaduct includes a two-span, steel through arch over the Los Angeles River. It was designed by Los Angeles city engineer Merrill Butler, but instead of the neo-classical look of his other bridges, this is more of a streamlined Art-Deco design. Steel members hang from the arches and support the deck with steel floor beams. Instead of circular arches, these arches are parabolic segments that descend well below the deck and are supported near the bottom of the center pier. All the piers have clean lines, matching the Art Deco buildings that were being constructed when the bridge was built (in 1932). The viaduct is 3546 ft (1080 m) long with 150 ft (46 m) long arches and it's 60 ft ( 17.9 m) wide with four traffic lanes. Unfortunately, the bridge was constructed using aggregates with reactive silica that weakened the concrete over time. Also the bridge hasn't been well maintained and the arches and rebar are rusted. In fact, no access was provided to get to many areas of the bridge. Today, this historic bridge has to be replaced, and at considerable additional cost if the city tries to duplicate the original design. Los Angeles River Bridges: Sixth Street Viaduct by Mark Yashinsky is licensed under a Creative Commons Attribution-NonCommercial-ShareAlike 3.0 United States License.